Since Red Hat Developer Toolset 4.1, the Red Hat Developer Toolset content is also available in the ISO format together with the rest of Red Hat Software Collections content at https://access.redhat.com/downloads, specifically for Server and Workstation. Note that packages that require the Optional channel, which are discussed in Section 1.5.3, “Installing Optional Packages”, cannot be installed from the ISO image. A portable compiler suite with support for C, C++, and Fortran. A collection of binary tools and other utilities to inspect and manipulate object files and binaries. A collection of binary tools and other utilities to inspect and manipulate ELF files. A tool to optimize DWARF debugging information contained in ELF shared libraries and ELF executables for size. A command line debugger for programs written in C, C++, and Fortran. A debugging tool to display calls to dynamic libraries that a program makes. It can also monitor system calls executed by programs. A debugging tool to monitor system calls that a program uses and signals it receives. A debugging tool to identify calls to library functions with overlapping memory regions that are not allowed by various standards. A tracing and probing tool to monitor the activities of the entire system without the need to instrument, recompile, install, and reboot. An instrumentation framework and a number of tools to profile applications in order to detect memory errors, identify memory management problems, and report any use of improper arguments in system calls. A system-wide profiler that uses the performance monitoring hardware on the processor to retrieve information about the kernel and executables on the system. A library for instrumenting and working with user-space executables during their execution. A dependency-tracking build automation tool. The Red Hat Developer Toolset version of the GNU Compiler Collection (GCC) has been upgraded to version 7.3.1 with many new features and bug fixes. The Red Hat Developer Toolset version of the GNU Debugger (GDB) has been upgraded to version 8.0.1 with many new features and bug fixes. For a full list of changes and features introduced in this release, see Section A.1, “Changes in Version 7.1”. Red Hat Developer Toolset 7.1 is available for Red Hat Enterprise Linux 6 and 7 for a number of architectures. 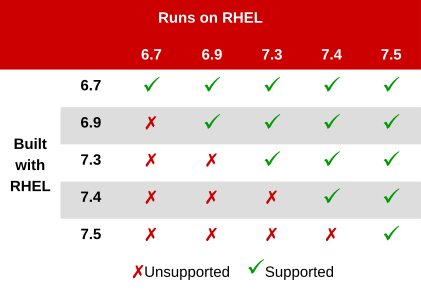 Figure 1.1, “Red Hat Developer Toolset 7.1 Compatibility Matrix” illustrates the support for binaries built with Red Hat Developer Toolset on a certain version of Red Hat Enterprise Linux when those binaries are run on various other versions of this system. For ABI compatibility information, see Section 2.2.4, “C++ Compatibility”. This content set is available to customers with Red Hat Enterprise Linux 6 and 7 subscriptions listed at https://access.redhat.com/solutions/472793. This content set is available to customers with deployments of Red Hat Enterprise Linux 7. Please note the difference: Red Hat Developer Toolset is an offering distributed as a part of the Red Hat Developer Tools content set. Enable Red Hat Developer Toolset by using the Red Hat Subscription Management. For information on how to register your system with this subscription management service, see the Red Hat Subscription Management collection of guides. For each available subscription, this command displays its name, unique identifier, expiration date, and other details related to your subscription. The pool ID is listed on a line beginning with Pool ID. For a complete list of subscriptions that provide access to Red Hat Developer Toolset, see https://access.redhat.com/solutions/472793. For both the regular repositories and optional repositories, replace variant with the Red Hat Enterprise Linux system variant (server or workstation), and version with the Red Hat Enterprise Linux system version (6-eus, 6, or 7). Replace repository with the name of the repository to enable. Once the subscription is attached to the system, you can install Red Hat Developer Toolset as described in Section 1.5, “Installing Red Hat Developer Toolset”. For more information on how to register your system using Red Hat Subscription Management and associate it with subscriptions, see the Red Hat Subscription Management collection of guides. Replace variant with the Red Hat Enterprise Linux system variant (server or workstation). This installs all development, debugging, and performance monitoring tools, and other dependent packages to the system. Alternatively, you can choose to install only a selected package group as described in Section 1.5.2, “Installing Individual Package Groups”. Note that in order to use this command, you need to have access to the repository with these packages. If your system is registered with Red Hat Subscription Management, enable the rhel-variant-rhscl-version-debug-rpms repository as described in Section 1.4, “Getting Access to Red Hat Developer Toolset”. For more information on how to get access to debuginfo packages, see https://access.redhat.com/site/solutions/9907. The devtoolset-7-package_name-debuginfo packages can conflict with the corresponding packages from the base Red Hat Enterprise Linux system or from other versions of Red Hat Developer Toolset. This conflict also occurs in a multilib environment, where 64-bit debuginfo packages conflict with 32-bit debuginfo packages. Manually uninstall the conflicting debuginfo packages prior to installing Red Hat Developer Toolset 7.1 and install only relevant debuginfo packages when necessary. This updates all packages on your Red Hat Enterprise Linux system, including the Red Hat Developer Toolset versions of development, debugging, and performance monitoring tools, and other dependent packages. Use of Red Hat Developer Toolset requires the removal of any earlier pre-release versions of it. Additionally, it is not possible to update to Red Hat Developer Toolset 7.1 from a pre-release version of Red Hat Developer Toolset, including beta releases. If you have previously installed any pre-release version of Red Hat Developer Toolset, uninstall it from your system as described in Section 1.7, “Uninstalling Red Hat Developer Toolset” and install the new version as documented in Section 1.5, “Installing Red Hat Developer Toolset”. When a new major version of Red Hat Developer Toolset is available, you can install it in parallel with the previous version. For detailed instructions on how to install Red Hat Developer Toolset on your system, see Section 1.5, “Installing Red Hat Developer Toolset”. This removes the GNU Compiler Collection, GNU Debugger, binutils, and other packages that are a part of Red Hat Developer Toolset from the system. Red Hat Developer Toolset 7.1 for Red Hat Enterprise Linux 7 no longer includes the libatomic and libitm libraries, which the above command attempts to remove, because they are not required for a proper function of Red Hat Developer Toolset components on that system. Nevertheless, the above command works as expected even on Red Hat Enterprise Linux 7. Note that the uninstallation of the tools provided by Red Hat Developer Toolset does not affect the Red Hat Enterprise Linux system versions of these tools. Docker-formatted container images can be used to run Red Hat Developer Toolset components inside virtual software containers, thus isolating them from the host system and allowing for their rapid deployment. For detailed description of the Red Hat Developer Toolset docker-formatted container images and Red Hat Developer Toolset Dockerfiles, see Using Red Hat Software Collections Container Images. The docker package, which contains the Docker daemon, command-line tool, and other necessary components for building and using docker-formatted container images, is currently available only for the Server variant of the Red Hat Enterprise Linux 7 product. Docker-formatted container images cannot be run on Red Hat Enterprise Linux 6, and Red Hat Developer Toolset Dockerfiles are not distributed for Red Hat Enterprise Linux 6. Follow the instructions outlined at Getting Docker in RHEL 7 to set up an environment for building and using docker-formatted container images. For more information about Red Hat Developer Toolset and Red Hat Enterprise Linux, see the resources listed below. Red Hat Subscription Management collection of guides — The Red Hat Subscription Management collection of guides provides detailed information on how to manage subscriptions on Red Hat Enterprise Linux. Red Hat Developer Toolset 7.1 Release Notes — The Release Notes for Red Hat Developer Toolset 7.1 contain more information. Red Hat Enterprise Linux 6 Developer Guide and Red Hat Enterprise Linux 7 Developer Guide — The Developer Guides for Red Hat Enterprise Linux 6 and 7 provide more information on the Eclipse IDE, libraries and runtime support, compiling and building, debugging, and profiling on these systems. Red Hat Enterprise Linux 7 System Administrator’s Guide — The System Administrator’s Guide for Red Hat Enterprise Linux 7 documents relevant information regarding the deployment, configuration, and administration of Red Hat Enterprise Linux 7. Get Started with Docker Formatted Container Images on Red Hat Systems — The guide contains a comprehensive overview of information about building and using docker-formatted container images on Red Hat Enterprise Linux 7 and Red Hat Enterprise Linux Atomic. Section A.1, “Changes in Version 7.1” — A list of changes and improvements over the version of the Red Hat Developer Toolset tools in the previous version of Red Hat Developer Toolset.